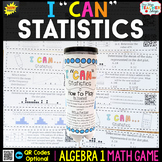 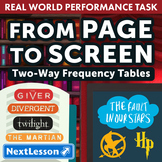 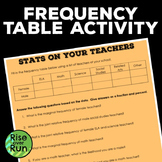 Students will create a frequency table by using real world statistics, stats of their teachers! 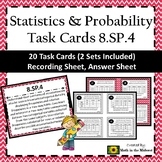 For this activity, students will need a list of the teachers in the school along with the subjects they teach. 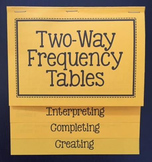 They will complete the frequency table based on males/females and the subjects they teach. 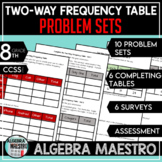 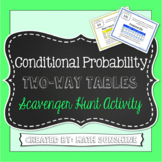 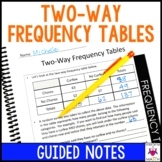 Two-Way Frequency Tables BUNDLE: 5 days - no prep! 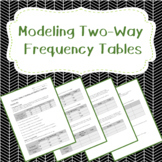 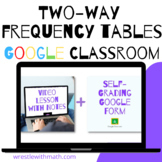 A simple worksheet for practicing two-way tables and relative frequency. 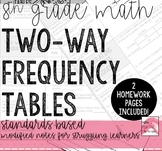 Great for use as homework, independent practice, or early finisher work. 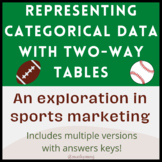 Complete two way tables giving parts of the data. 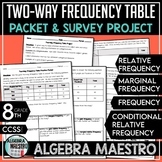 Then calculate the relative frequency (percent) for each row, then for each column and then for total surveyed. 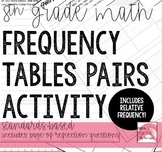 3 Practice problems with Frequency and Relative Frequency included higher order questioning.